Dina Marques remembers the bad old days, when the 350 students at Los Nilos County School didn’t have safe drinking water. “The kids came maybe three of the five school days each week because they’d be sick at home one day and have to go to a clinic the next day,” recalls Dina, who’s been vice principal of the school in rural El Salvador for more than 30 years. The school had a well, but the water was safe only for handwashing and cleaning the classrooms. Then, in 2017, Samaritan’s Purse approached the school with an offer to install a Samaritan Filter and provide the students with health and hygiene training. “At first, Dina didn’t believe me that it would happen because many people offer things and never follow through,” says Ken Morill who leads our El Salvador filter program. Still, Dina and the principal said yes to Ken’s offer. That’s when life started to improve at Los Nilos County School. Samaritan Filters use the same sand filtration technology of BioSand Water Filters, which we are building and installing throughout El Salvador (almost 10,000 in the last 18 years) thanks to the financial support of Canadians like you. 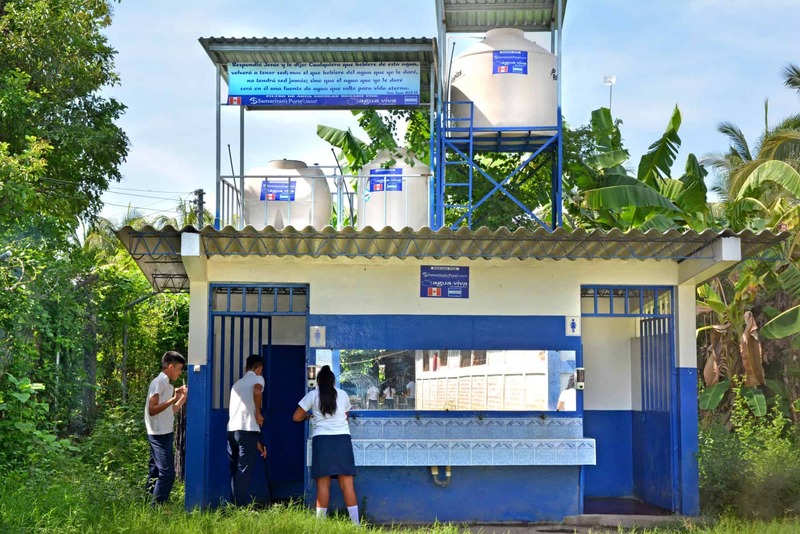 BioSand filters are designed for families; Samaritan Filters—which we have constructed and installed in three El Salvador schools and churches—provide all the daily drinking and cooking water necessary for hundreds of people. “This is a blessing,” says a grateful Dina, relaxing in a shady part of the school’s humid central courtyard while children attend classes in buildings around her and volunteers prepare student lunches. 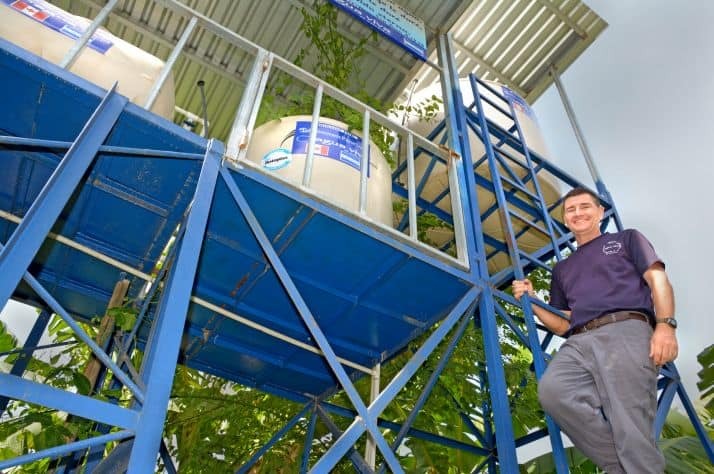 She estimates school attendance has improved 10 per cent since the filter’s installation. As part of that installation, Samaritan’s Purse built water stations throughout the campus so students never have to go far to get a drink. Just as important, in Dina’s mind, is the health and hygiene training we began providing to students even before the filter was installed. That training included clear and simple messages about why the children’s lives will be better when they follow Jesus Christ, “who is and who was and who is to come, the Almighty” (Rev. 1:8, ESV). “We are so grateful that you wanted to talk to the students about Christ, not just about water,” Dina says, adding she and the principal asked us to do the training during classes (rather than before or after school), to ensure every student heard the messages. “Many of our kids attend the nearby church, but others come from further away and never hear about Jesus,” she notes, adding in some classes a majority of students who heard the messages prayed to receive Christ as their Lord and Savior. Praise God! The training has been so well received that Dina connected us with two other schools that didn’t need filters, but did need to hear the Good News of Salvation. The leaders of both schools said yes to our offer to tell students about the “eternal power and divine nature” (Romans 1:20, ESV) of Jesus Christ. You can create healthier homes, schools, and communities in developing countries through your support of Samaritan’s Purse Water Projects. Please consider contributing toward the $10,000 cost of building and installing a Samaritan Filter for a school, community center, or church. You can supply a family with a BioSand Filter for $150, and a gift of $25 can provide safe water for one person.